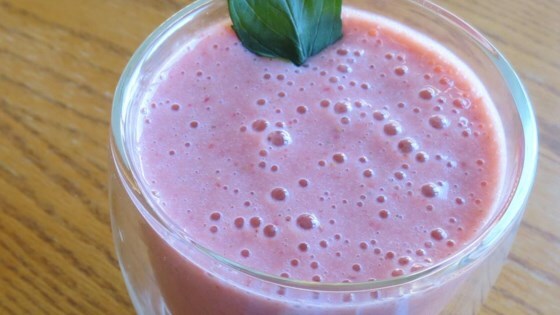 "This healthy, creamy smoothie is so refreshing on a hot day! Make it an adult beverage by adding rum. It's like a healthy version of a strawberry daiquiri! You can add a dash of cinnamon to give it an extra kick." Combine ice cubes, strawberries, kefir, mint leaves, vanilla syrup, and orange juice together respectively in a blender and blend until smooth. A healthy, fruity start to your morning. Use fresh or frozen strawberries. You can substitute honey for the vanilla syrup. It was delicious. It had a very good, sour yet sweet sort of taste. I use bananas with my kefir and add a spoon of flax seeds for health but any fruit works. Great way to start the day.